When any couple moves in together, there is a lot for each to get to know in the other. In our case, we never had the time! 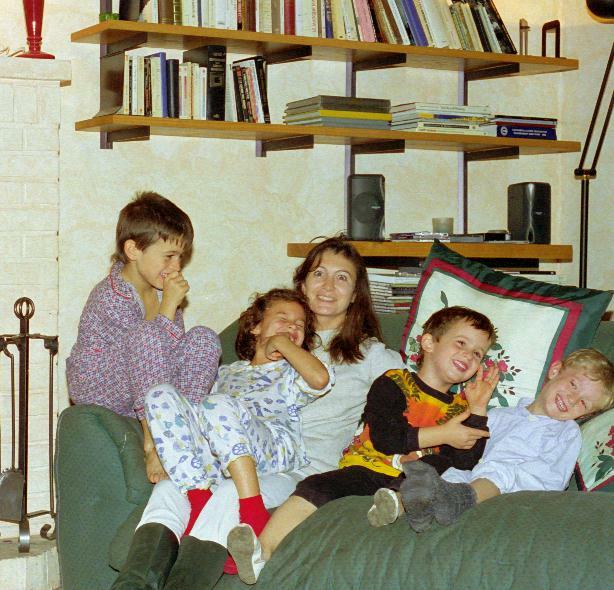 Here they all are, our first four children, fooling around with Marie-Hélène at Le Tahu, maybe to avoid going to bed, maybe for no reason at all. Le Tahu was our first home, and it was late 1994. Boy was it ever wild in our house! There is another photo from the same sequence on the 1994 page: the year that we moved in together, our whole little world was like a hurricane. No, that’s not what I mean! I mean that in our case our four older children, Nick and Tom from my side of the new family and Daphné and Alban from Marie-Hélène’s side, also needed to get to know each other and learn how to live together. Handling that inevitable whirlwind of energy took much of the parents’ time. Our two pairs of children were Daphné and Alban, on the one hand. . . . This was taken at a café in Quiberon, a beautiful peninsula on the southern Brittany coast not far from La Grée. To give just one example, but a major one, of the powerful dynamics that forming our family set off, each pair of children had an older child, who was used to being the boss. We thus had competing older children, a competition which continued into adulthood, with neither Daphné nor Nicholas ever understanding why the other has not simply conceded and submitted! How the parents handled this conflict or otherwise, or to put it another way the effect of this conflict on us, goes some way toward explaining some of the problems that Marie-Hélène and I had together. But that’s a story for another page.
. . . and Nick and Tom on the other hand. This was taken in Le Tahu in March 1996, not long before we moved out. 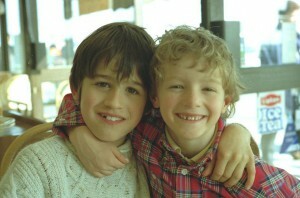 Blending existing families is very complicated, much more so than parents typically realize when embarking on the task. We certainly had no idea when we started out. All those competitive dynamics between and among children, which are hard enough to handle when the children are with both their own parents, become more intense and harder to regulate when each child can accuse one parent of favoring HIS or HER own children. Which of course our older children all did and do in one way or another, as soon as they discovered that they could. It took all ours about a day to figure that one out in 1994! No, that’s bit of an exaggeration. It actually took a while, at least a few months in the case of the older two, and a year or more in the case of Alban and Tom. In any event, the latter two were less concerned about who was in charge, because each had already learned that it was not him! 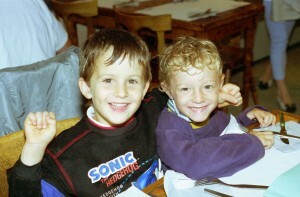 and then Thomas and Alban in 1995 at Flunch (French fast food with an English word) in Rambouillet, where we used to grab a bite after doing the grocery shopping at Carrefour. What is that in their hair!! Having spent years myself biting my nails and watching like a hawk for parental favoritism of my sister, I don’t suppose that there’s any point in saying this. But the sad thing would be if accusations of favoritism continue among our children after they move on with their own lives, as they have each started to do. I hope for their sake that they don’t waste their time and energy focusing on real or imagined imbalances between or among themselves. There’s not been a lot of that, honestly, and in any event, real or imagined disparate treatment ultimately doesn’t matter that much if you are truly loved. 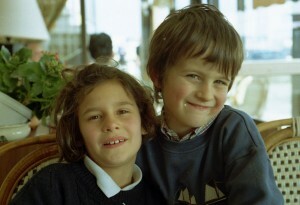 Nick and Alban in that Quiberon café, March 1996. 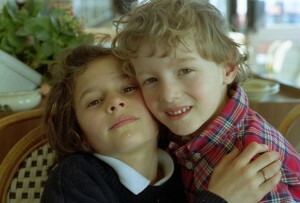 All of our older children were and are loved very much, even when they were at their most difficult as adolescents. Well, to be honest these reflections are addressed much more to our older children: Charlie and Alex lived with both of their parents and could not accuse either Marie-Hélène or me of favoring her or his own children relative to them. They could and did and do accuse both of us of favoring the other, of course, but we handled that more easily. 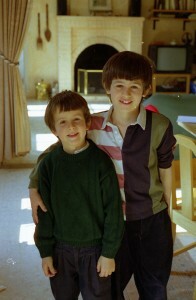 It was almost easy relative to their older siblings. That’s the key blending issue revealed to us indirectly through Charlie and Alex, our own unblended joint efforts. Another one in that Quiberon café. We were all with grand-père, and it was a great day out. Each of Nick, Daphné, Alban and Tom could more easily make the favoritism accusation and feel the related injustice. But they didn’t do either much during our first few years together. 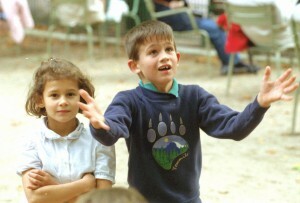 Partly they were younger, and partly when Marie-Hélène and I started out we were somehow better with them. Maybe it was that our love was fresh and euphoric and everything was new. That’s how it felt. Integrating the children was doable, helping them feel good about themselves and each other was doable, it was all doable, if we did enough right. 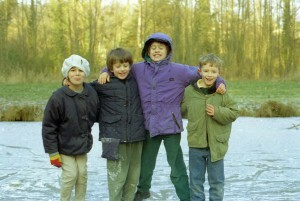 All four of them romped around on the frozen pond in front of La Bellanderie, in April 1997. 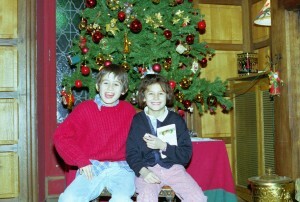 When we first moved in together, the children mostly wanted to be kids. Just kids. They wanted to forget the rest, distract themselves from the parental break-ups that all had suffered through and were still suffering through, from the passion plays encircling them and using them. They wanted to be kids. Take shopping, for instance. 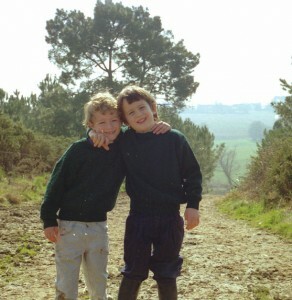 Until we left France in 1997, we did most of our grocery shopping at Carrefour in Rambouillet. It’s a very big supermarket: think WalMart. The children often accompanied us, at least through the doors and past the turnstiles and into the store. Visit to the coiffeur, in the Carrefour in Rambouillet, 1996. It was all an adventure in those days. Then all hell broke loose. There was nothing whatever that we could about it. They were going to run around, sometimes together, sometimes in pairs, most often squealing and yelling, and always zooming backwards and forwards. They always had an itinerary, and it changed as fast as they could execute it. And they were fast, and they were loud! We could never keep up, and soon gave up trying. Marie-Hélène and I found that the easiest strategy in front of the other shoppers was to pretend that we did not know them! This rarely worked of course, because one or other group would return to find the parents to ask for this box of cookies or that toy. Not forgetting that expensive electronic device! Our overall goal on each trip grocery shopping was to make it to the checkout before they drove us crazy. Sometimes we made it; sometimes we didn’t. If I could just go back and bottle those shopping trips, that crazy motion, those excited little voices running up and down the aisles! Then, it drove me crazy: now I wish I could have held on to it somehow! 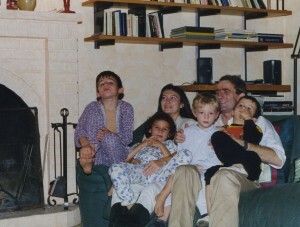 Our five children in December 1996, happily blended and happy together. It was the night of the “Parade des Rois Mages” in Rambouillet. There were lots of moments like this. 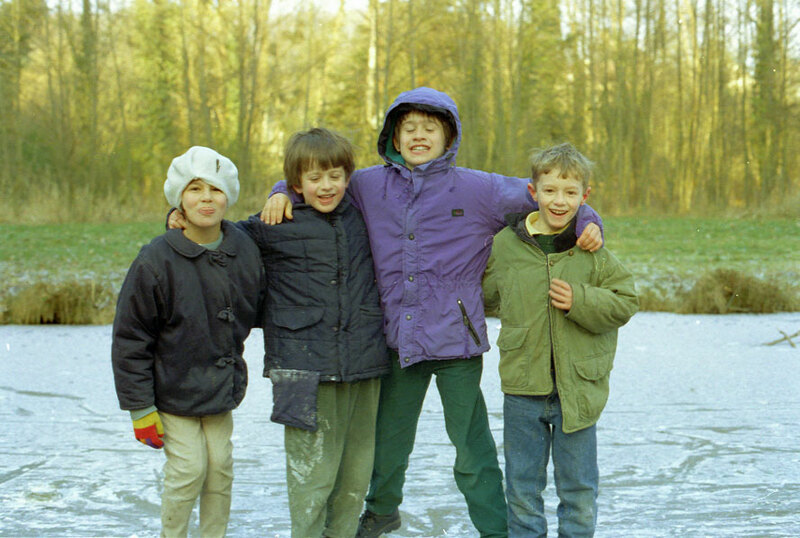 From the left, Alban, Daphné, Tom, Nick and Charlie. 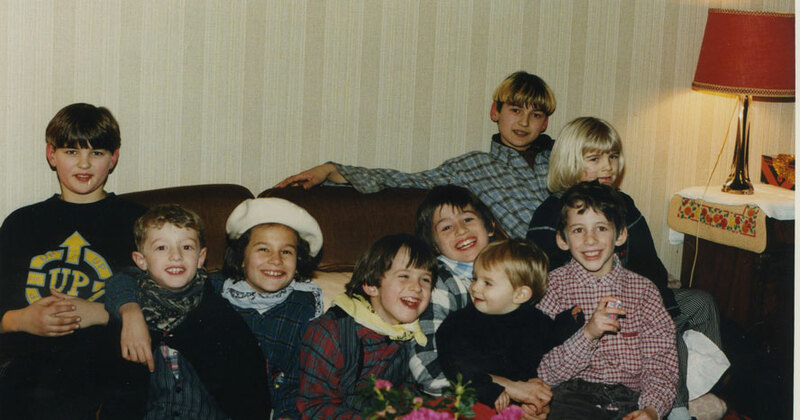 They were with Martin, Simon, Maike and David, friends of the family. Marie-Hélène figured out immediately that this sort of freedom of expression (and no-one knows what freedom of expression means until a child puts you to the test!) was what they needed. She was patience personified. So did my mother. With Grandma’s help, as well as help from the Walt Disney Company, that’s what we did, as much as we could, we let them be children. Their lives were game after game, vacation after vacation, Disneyland ride after Disneyland ride. The annual Disneyland passports that Grandma gave us all, all six of us, for two years running, were the single biggest contribution to helping our children be children again after all the stress of the two parental separations and their aftermaths. 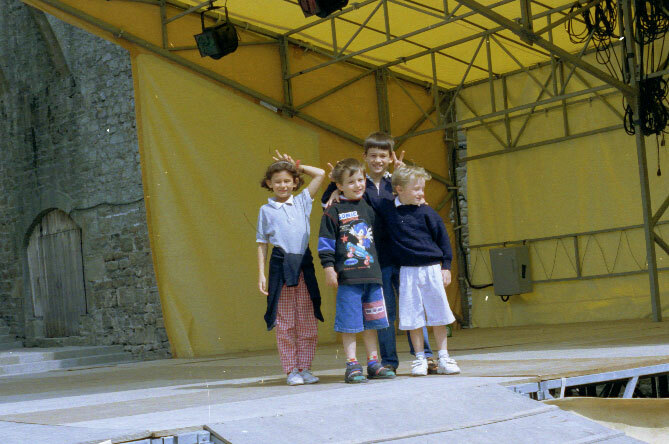 On a stage in St. Malo, August 1995. St Malo, on the north coast of Brittany and less than two hours by car from La Grée, was one of our favorite holiday spots. But Grandma’s many contributions would have accomplished much less, were it not for Marie-Hélène. She deserves a ton of credit for the success of our early years as a blended family. I stress out easily, and was easily manipulated. She focused and reflected and sat back and played fair, and the four older children all loved that. We both tried hard to play fair, to be honest. As the primary caretaker, her efforts were key. She was amazingly balanced, almost British in her desire to play fair and her capacity to implement that desire. (Yes, yes, for once, a bit of a plug for my native land: we Brits are pretty good at being fair and balanced). When they laughed, and these children laughed a lot, they could really let it peal! 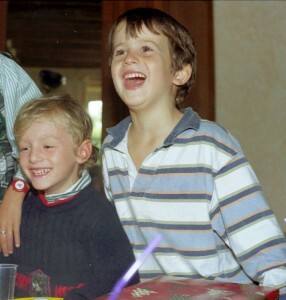 This was at Alban’s sixth birthday celebration in September 1995 at Le Tahu. You can see the blending working in our pictures. Looking back through our collective photos of the period 1994 through 1997, there are many at first with Daphné and Alban looking sad (Pierre, their father, was sharing his unhappiness with them every time he spent time with them) and many at first with Nick and Tom looking revved out of their minds (Sunshine, their mother, was sharing her rage with them every time they were together). Then all of us look happier, visibly having more fun, after we’d all been together for a year or two. It was a great time all around, and I’m so glad that it is there to look back on. The good old days. Learning to live with each other: Daphné and Nicholas in the Jardin de Luxembourg, Paris, October 1994. 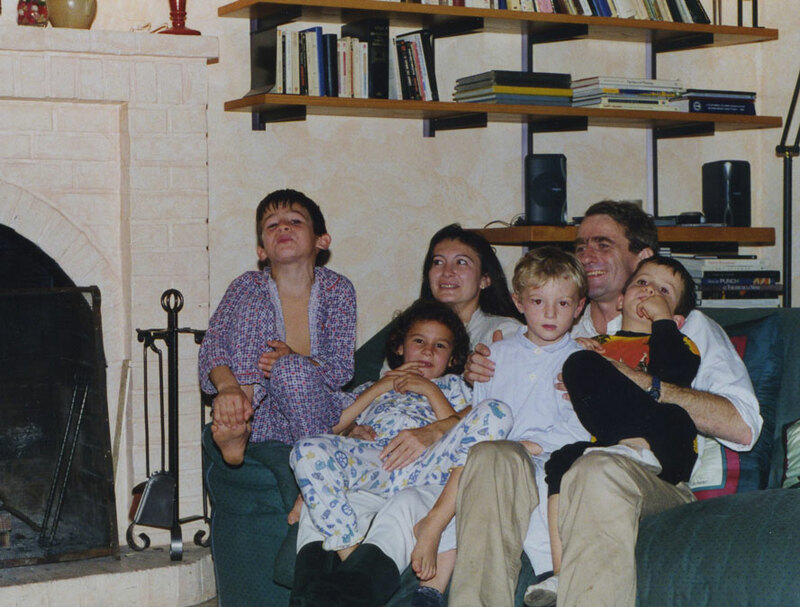 It took a lot of work, but before we were all separated by the courts in June 1997 (another story told here: Missing You), a separation which lasted for two whole years, an eternity for children, we were a very happy family, with balance, and fun, and even mutual respect. The children were all getting along fine with each other and with us. The Versailles Court of Appeal surely had no idea what it was doing to our hard-earned family, to all our hard work. The three judges meant well, as judges do, and they certainly believed that they were advancing the best interests of our children. For one reason or another, we would never retrieve or recreate quite the same magic after we were all together again in Santa Cruz. It might just have been the fact that the children were getting older, more adolescent and less able to adjust and adapt. It might have been that the local Disneyland was now much further away! It might have been the assorted miseries of our move to the US, losing our furniture for three years as well as Nick and Tom for two. It might have been that Marie-Hélène and I were simply getting worn down over time, and no longer had the necessary reservoirs of energy. It’s a story for another page. Early on in Le Tahu, one of the first group of photos of us together. But we had made something very special in those first three years together in France, and repeating it was as unlikely as repeating that first flush of a new romance. The blending still worked in Santa Cruz, the blended family still worked, because we still put a lot of effort into it. But here and there we, the parents, failed. Then again, sometimes what felt like our failure was perhaps the perfectly normal centrifugal motion of the teenager, away from the family center. What has never changed, what reassures me as I put this memoir together after the parents broke up, is that all of our four blended children remain inflexibly loyal to Charlie and Alex, their little brothers, still the glue binding them all together. St. Malo, cité des corsaires . . .